West of Phoenix, Arizona, where cooling towers billow steam into the air, the Palo Verde Nuclear Generating Station churns out more carbon-free energy than any other power producer in the country. But, in the light of a controversial ballot measure meant to steer Arizona towards renewable energy, Palo Verde’s fate has been caught in the crossfire of a battle between state utilities and environmentalists. Clean Energy for a Healthy Arizona, a committee backed by former Californian hedge fund manager Tom Steyer, drives the initiative. They submitted over twice the amount of signatures needed to get on the ballot. If successful, the measure would constitutionally require Arizona utilities to use 50 percent renewable resources by 2030, holding them accountable for certain percentages each year. But Arizona Public Service, the state’s largest utility, funded a lawsuit filed last week against the initiative. The political action group that filed the suit claims most of the signatures are fraudulent, which the initiative denies. The utility has bigger worries than the signatures, though — they’re worried the measure would force Palo Verde to close in six years. An oversupply of solar, they say, would render the plant useless. “A clean energy future is something we support,” the utility’s spokesperson Jenna Rowell said, “but you get there through a flexible plan.” The utility owns about a third of the plant, which they licensed to operate until the 2040s. In Nevada, an identical, Steyer-backed measure is already on the ballot. If the measures pass in November, the two states will join California as the West’s most ambitious examples of renewable commitment. Whether the measure succeeds will determine a step in the West’s path towards cleaner energy — and whether nuclear power, the country’s stronghold of carbon-free power, will be along for the ride. On its face, the fight between the Clean Energy initiative and utilities is about the price tag. The Arizona utility claims that customers would see a $1,200 average annual uptick in their bills were the initiative to pass. That prediction is based on estimates done by the utility for solar infrastructure and maintenance costs between now and 2030, Rowell said. The Navajo Nation, whose coal generating plant is on shaky ground, also opposes the initiative because of its rumored rate hikes. The Clean Energy committee disputes the $1,200 figure, saying solar would be cheaper for customers. Wesley Herche, an energy researcher at Arizona State University, released a study that found no correlation between renewable standards and rate increases in U.S. states. He said that solar prices have dropped more than four times what they were in 2006, when Arizona first committed to a renewable standard of 15 percent by 2025. The two sides agree on little about the measure’s possible effects. Herche said that it’s difficult to convince old-guard utilities, especially those with financial stakes and decades-long commitments to plants like Palo Verde, to pivot to fast-changing renewables technology. “If you’re a company that operates one way, and you’ve always operated that way, it’s hard to all of a sudden to ask them to change, to be nimble, to be Silicon Valley-like,” he said. As the lawsuit stymies the ballot measure, Palo Verde’s future is a loose end. 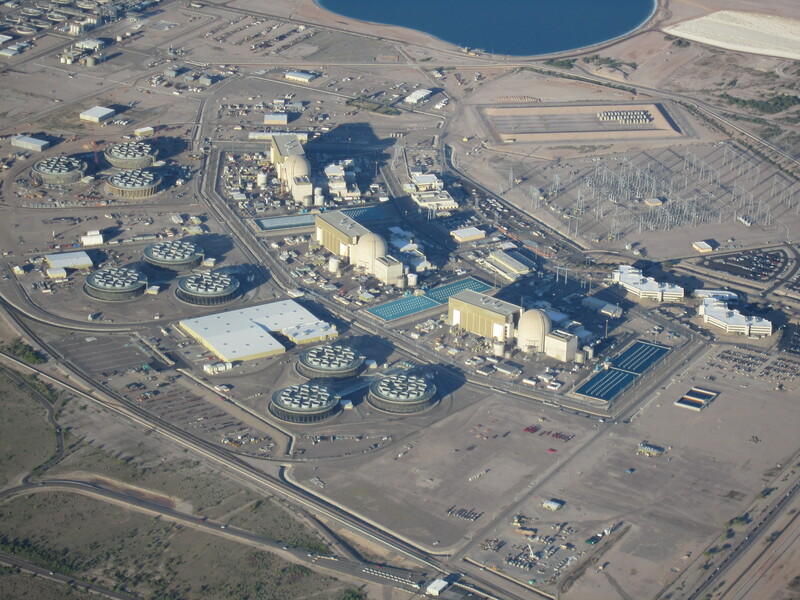 Arizona Public Service says the plant will shut down if the measure succeeds. If it closes, thousands of employees would lose their jobs. But the Clean Energy group points to predictions that say the plant could stay open even if the measure passes. Beyond Arizona, nuclear energy’s place in the carbon-free future of the West is an open question. In California, whose renewable goal is already 50 percent by 2030, nuclear plants have closed decades before their licensed expiration dates, struggling to compete with cheaper natural gas and solar. Whether nuclear plants should stay open as a stable alternative to fossil fuels divides environmentalists. Amanda Ormond of the Western Grid Group, which promotes incorporating clean energy into the grid, thinks nuclear power is an obstacle to a functional renewable future. In the meantime, a utility regulator has proposed an alternate clean energy plan to the Arizona Corporation Commission, the organization that regulates the state’s utilities. Commissioner Andy Tobin wants to require utilities to meet an 80 percent target, including nuclear, by 2050. “The one thing I know about energy right now is that everything is uncertain,” Tobin said. He wants his plan to push clean energy without amending the constitution. Elena Saavedra Buckley is an editorial intern at High Country News.